We recently traveled to Albany for a couple of days in the Porongurup range. To reach Albany the options are – fly, drive or public transport (TransWA). Driving is probably the most most common method as to explore the area you do need a car. 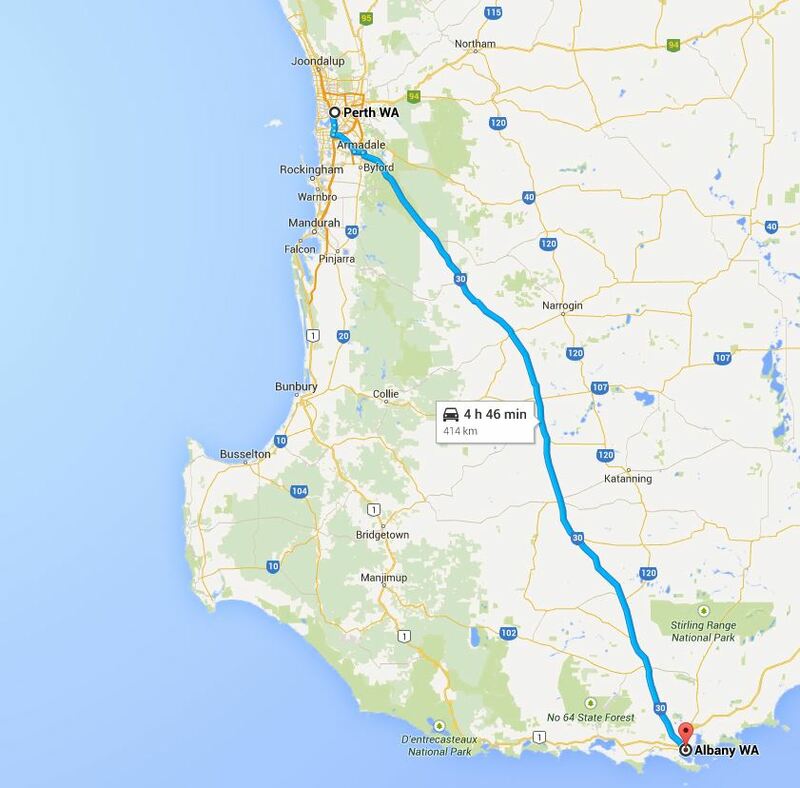 It is almost a 5 hour drive south of Perth, Albany Highway from Perth will indeed take you all the way to Albany! We encountered quite a few of those long road trucks and the overtaking lanes allowed us to pass on by, but for the most part it is a single lane all the way down. One of the biggest risks about long distance driving, is driving tired and becoming a zombie. The good news though, is that along the way there are pull over bays to stretch your legs and take in the fresh air. Road houses serve the standard hot chips, pies and sausage rolls. There are also a couple of cute little country towns to stop through as well. Break up the journey by incorporating a few places to check out, that’s the beauty about the area – there is plenty of attractions within close proximity to the highway. We generally pack food in an esky for the first night and breakfast the next day so that when we arrive we can explore and settle in. However, in saying this, there are supermarkets along the way within easy reach. Williams can be reached in 2 hours from Perth. The Williams Woolshed is open 8am to 4pm and serves food and coffee as well as local wine and jam, preserves and pickles. Kojonup is a nice little town of flower front cottages, a gigantic wagon, supermarket, cafe and bakery. There are also a couple of wineries nearby if you wish for a longer stop. Gilbert Wines is north and also has a cafe on site. Kojonup Country Kitchen on Albany Highway is worth a stop too, serving coffee and lunch. You’ll see some ANZAC nostalgia in the area, Kojonup was where Brigadier Arnold Potts once lived. He commanded the brigade that held back the Japanese advance during bitter fighting on the Kokoda Trail in World War II. Visited Kojonup Reserve, the largest protected area of Wandoo Woodland and you may just spot a bearded dragon if lucky. The last stop before we reached our accommodation was Mt Barker. The town has quite a few amenities such as supermarket, petrol station, cafes and restaurants. There is even a beautifully crammed antique store. We had a coffee from The Happy Bull Cafe which also serves some yummy looking steaks. Book in for a visit at Uralla Wildlife Sanctuary and see a kangaroo up close. Don’t forget to leave a donation. Stop by Castle Rock Winery and pick up a nice bottle of wine. Castle Rock walk is a good hike to wake up the legs, and at the top the views are amazeballs! Take your time and enjoy the transition from city life to country life. Take a break at one of the towns and incorporate some sightseeing along the way. A GPS system is very handy and if you do not have this, a printed map will do. We purchased a map from Dymocks Bookstores and picked up a couple of free brochures from the tourist bureau in Perth. There is plenty of signage along the way indicating the distance to the next town. Pack a spare canister of petrol, car tyre, water, radiator stop leak and coolant in case you run into problems with the car. Budget for fuel in your travel budget, it cost us roughly $90.00 to reach the area. $180.00 return. Bring food for the first night and breakfast the next morning. After a long drive you will just want to relax and settle into the new surroundings. Sitting on the porch with a wine and some food enjoying the sounds of the outback is much more enticing then running off to the supermarket. We pack an esky with ice for a days worth of food. If time is our luxury, we’ll stop by a picnic table spot and make a quick salsa of avocado, cucumber, tomatoes, goats cheese and eat with corn chips. Happy Driving Everyone! Do you have any tips or experiences for the drive down to Albany? Have you seen our travels of the area?